A cold store essentially consists of a number of refrigerated chambers which are able to chill, freeze and store any perishable product. Certain general substructural conditions must be fulfilled to construct a cold store successfully: site selection for easy access by road and train; terrain of good mechanical resistance and without problems of surface water; good supply of potable and industrial water and electricity; drainage facilities. As well, the local availability of labour (technical personnel, skilled labour for maintenance and general labourers) should be investigated. Although a cold store is essentially an area where products are preserved, plus a site for the machinery room, it is obvious that complementary spaces are necessary: office, laboratory, public services, toilets and cloakroom, spare parts room and workshop, and packaging material storage. Some other services may be found annexed to a cold store, such as cutting and deboning, salting, meat products manufacture, packaging, and a sales office. Before planning a cold store it is important to define operational and technical specifications. These are strictly dependent on products, stores, storage conditions, environment, energy and personnel. The publication Guide to a refrigerated store (IIR, 1976) includes an exhaustive checklist worthy of use at this planning stage. The general features of a cold store operational programme (products, chilling and chilled storage, freezing and frozen storage, cutting, deboning and packaging, stocks, daily movements) include total capacity, number and size of rooms, refrigeration system, storage and handling equipment and access facilities. The relative positioning of the different parts will condition the refrigeration system chosen. The site of the cold chambers should be decided once the sizes are known, but as a general rule they should be in the shade of direct sunlight. The land area must be large enough for the store, its annexes and areas for traffic, parking and possible future enlargement. A land area about six to ten times the area of the covered surface will suffice. There is a general trend to construct single-storey cold stores, in spite of the relatively high surface: volume ratio influencing heat losses. The single storey has many advantages: lighter construction; span and pillar height can be increased; building on lower resistance soils is possible; internal mechanical transport is easier. Mechanical handling with forklift trucks allows the building of stores of great height, reducing the costs of construction for a given total volume. The greater the height of the chambers the better, limited only by the mechanical means of stacking and by the mechanical resistance either of the packaging material or of the unpackaged merchandise. 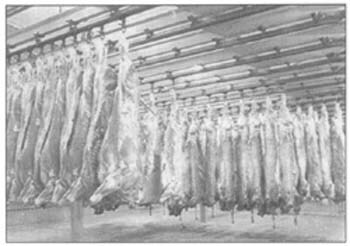 In fact chilled meat carcasses, which cannot be stacked, limit the height of the chamber as they are hung from rails (see Figures 1 and 3). Chilled quarters and cuts can be mechanically handled for storage without stacking (see Figures 2 and 4). The length and width of the chambers are determined by the total amount of merchandise to be handled, how it is handled (hanging from rails, forklift trucks), the number of chambers and the dimensions of basic handling elements. There is no advantage in building many chambers of a small size, particularly for meat products. Thermal and hygrometric requirements are not so strict as to justify a lot of rooms: the accuracy of the measuring instruments and the regulation of conditions inside the chamber always produce higher deviations than those of ideal storage conditions for different products. This is particularly true for frozen products. Chilled meats of different species (beef, pork or mutton) can be stored in the same room as they do not present temperature or tainting incompatibilities. Frozen meats have even less problems. Stores for refrigerated products are usually more divided and often of lower height than those for frozen goods. A design that opts for fewer, larger chambers represents in the first place an economy in construction costs as many divisional walls and doors are eliminated. Refrigeration and control equipment is simplified and reduced, affecting investment and running costs. Large chambers allow easier control of temperature and relative humidity and also better use of storage space. Only in very particular situations should the cold store be designed with more than five or six cold chambers. Store capacity is the total amount of produce to be stored. If the total volume of the chambers is filled, the quantity of produce by unit of volume will express storage density. Several parameters must be defined within a cold store. The total volume is the space comprised within the floor, roof and walls of the building. The gross volume is the total volume in which produce can be stored, that is excluding other spaces not for storage. The net volume represents the space where produce is stacked, excluding those spaces occupied by pillars, coolers, ducts, air circulation and traffic passages inside the chambers that are included in the gross volume. Storage density referred to as net volume is expressed in kg/useful m3, but is most commonly referred to as gross volume. An index of how reasonably and economically the cold store has been designed is the gross volume divided by the total volume. It must be in the range of 0.50 to 0.80. Similarly gross volume is about 50 percent greater than net volume, and gross area (same concept as volume) is about 25 percent greater than net area. The extent of occupation is the ratio between the actual quantity of produce in storage at a given moment and that which can be stored. Equally the extent of utilization is the average of the extent of occupation during a given period — usually a year, but it can also be per month. The operation of cold rooms must take into account the storage requirements of the produce, rules for loading, maintenance and hygiene, and the running and maintenance of the refrigeration equipment. The loading plan will depend on the type of cold chamber, whether it is for preliminary chilling, for chilled storage or frozen storage. Preliminary chilling, which is done in the slaughterhouse itself, depends on the slaughtering rate as this determines the amount of meat to be chilled hourly. To avoid keeping the store door continuously open, freshly killed warm carcasses are separated into lots and introduced into the chilling chamber every half hour, for instance. Carcass movement inside the store should be designed in such a way that warm and wet meat faces the air from already chilled carcasses. Overhead rails must be placed so carcasses are oriented in the sense of air circulation, and to prevent them from touching each other. It is sometimes advisable to divide the total chilling capacity among a few chambers, computed on two hours' slaughtering, when the capacity is high enough (10–40 t/day). Another option for high slaughtering capacity (over 40 t/day) is the continuous chilling system, where carcasses pass through a chilling tunnel transported by a mechanical conveyor for two to four hours and are then put in a cold chamber to undergo final chilling. Chilling facilities should be systematically emptied after chilling and before preparing for the following day's production. Already chilled carcasses are placed in a refrigerated store. The storage rooms should be at least equal in capacity to the chilling rooms. If fresh meats are intended for quick distribution they should not leave the chilling facilities until the temperature of the warmest point is below 7°C, meaning an average temperature of about 2°C. The storage density of carcasses on hooks is dependent on the spacing of the rails, the height of suspension and the size of the carcasses, and very little on the unit weight of the carcasses. Figures 3 and 4 show details of carcass disposition and loading plans. Tables 3 and 4 give some data on storage densities. Meat is frozen in full carcasses, or in halves for small and medium-size animals and in quarters for large animals. The disposition of meat in a freezing chamber or tunnel is similar to that in the chilling operation. However, frozen meat is not stored hanging from rails but loose on the floor, on racked pallets or in boxes when it is cut up and/or deboned. Figure 5 gives a diagram for loading on pallets for long-term frozen storage and the correct system for loading. Table 4 gives some useful data on stacking densities for frozen meat. These are on wall hooks spaced at 125 mm or disposed in tubs of 30 litres. From: FAO Agricultural Services Bulletin 19/2, Rome, FAO, 1984. From: FAO Agricultural Services Bulletin 19/2. FAO, Rome, 1984. Fresh chilled meat carcasses are not wrapped, but small meat cuts are usually prepackaged under vacuum which favours stacking as the small packets are stored and handled inside rectangular boxes or cartons. Frozen carcasses and quarters are enclosed in polyethylene film and a cotton stockinette to protect against soiling and contamination; in this way they can be stored in piles or pallet boxes. Frozen small cuts are prepackaged like chilled cuts. Meats packed in boxes and frozen meat on pallets are usually stacked. Stacking methods and height depend on several factors: resistance of the package, handling techniques and thermal state. The resistance of the package dictates the total weight the lowest can support. 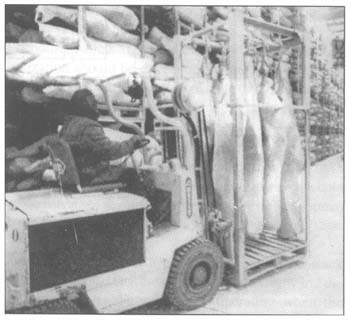 Carcasses of frozen meat can be stacked in bulk to heights of 8–10 m. When stored on pallets the height of the pallet load for carcasses can reach 1.9 m (Figure 6). Pallets can be equipped with corner supports of detachable metallic framework, placed around the load and transferring the weight from the upper pallet to the lower. Packaged and frozen meat is usually handled mechanically, combining forklift trucks with pallets. Besides the rapidity of operation (10–20 t/h per truck) and the great height of the stacks, any part of the stack is easily accessible, which reduces the need for lateral gangways. With mechanical handling pallets are easily moved within the store. A layout plan for palletization should be drawn up to control loading and stocks and each cold chamber should have a control table (see record sheets in the annex) by which any pallet or stocked product can be identified. Conditions for air circulation in completely filled chambers or tunnels have been given in Chapter 2 for chilling, freezing and storage. However, a cold room takes some time to fill (six to seven hours for primary chilling rooms) so for part of this time it is only partly filled; nevertheless air circulation must be correct. To maintain the circulation of air in a partly filled room the stack alignment must be perpendicular to the direction of air movement and the stacks placed close to the cooler. Fans must be operating when the refrigeration system is running and it is advisable to stop them only during the defrosting period. Two-speed fans should be used to adjust to air circulation needs in the room. Stacking must follow exactly the layout prescribed, respecting loading limits and allowing space between the stacks and walls, and below the pallets. The palletization layout plan must take account of distances between store elements. They are in the range of 5–10 cm between pallets, 15–20 cm along the walls and a stacking limit of 40–60 cm below the ceiling. The gangways for forklift truck circulation depend on the type of truck, but are in the range of 2.15 to 3.0 m.
Air circulation inside the store is expressed by the air speed (m/s) through an empty cross-section of the store and also by the chamber coefficient of air circulation, which is the number of times the air equivalent to the total internal volume of the empty chamber passes through the cooler in one hour. Both are obviously related, but the latter is more commonly used for chambers than for tunnels as it gives a clearer idea of air movement. Air change refers to replacing the air inside the chamber with clean external air, thus avoiding an accumulation of undesirable odours or volatile components. Air changes need not be considered in frozen storage as frozen produce does not give off odours but it must be taken into account for chilled products, particularly if they are mixed. It is especially important for meat products that the external air comes from a clean source, with no noxious components, and it should be passed through a filter fine enough to retain at least dust. Air should be changed as seldom as possible as any change disturbs the storage conditions and increases running costs: the external air has to be dried and cooled and the frost deposit increased on the evaporator. The outside air should be cooled and dehumidified before entering the chamber, or it should at least go immediately over the cooler. It is possible to calculate the volume of introduced air required to reduce contaminant concentration to a safe level but in general it should be equal to five times the volume of the room to reduce contaminants by 99 percent (although it has been claimed that if this volume is less than eight to ten times the volume of the room the dilution of contaminants may be incomplete). Air change can be achieved in a small room by opening the door, but this is a cumbersome method, alternating with brief periods of running the refrigeration machinery to restore storage temperature. For large rooms of over 1 000 m3 it is necessary to employ fans to induce change and drive the outside air over the cooler. It follows that every time the cold store door is opened an air exchange is generated by inside and outside air density differences. Although this exchange is sometimes beneficial, when the door is open too long or the type of product stored does not need air purification it clearly becomes an extra running cost and has to be prevented. When products leave the cold room there is a risk of condensation of atmospheric humidity on the cold surfaces, making them wet and liable to microbial development. This can damage the packaging materials or spoil their appearance, which can sometimes be irreversible if carton or cardboard packaging is used. Condensation occurs when the dew point of the ambient air is higher than the surface temperature of the product or its packaging. At this point it is necessary to take some precautions, such as proceeding on a progressive rewarming pattern, or promoting quick evaporation of the moisture formed by introducing slightly warmed dry air, or covering the product with awning or, finally, using packaging materials that resist the adverse effect of the moisture. The graph in Figure 7 shows how to calculate if there is any risk of condensation when moving a product from storage to a different ambient temperature. For efficient management and stock control, any unloading operation must obviously be written on the control table for the chamber, including all relevant data (see loading and unloading record sheet in the annex). before storing animal products in rooms that have contained strongly odorous fruits and vegetables, deodorize by washing, prolonged ventilation and finally spraying with a solution containing ammonium salts. Hygiene must be maintained after storage, during transport and distribution. Transport over long distances should be in refrigerated vehicles, which must be cleaned and disinfected after every day's duty. From Recommended conditions for cold storage of perishable produce. International Institute of Refrigeration, Paris, 1967. There are two very distinct systems of meat handling. The first is for carcasses or large cuts during chilling and chilled storage. The meat is hung on overhead rails of appropriate height, which can be pushed by hand or can be mechanically transported. The latter is more common in continuous systems and high-capacity stores. The second method uses forklift trucks and is employed for frozen meats of different shapes, chilled or frozen packaged cuts in geometrical containers and even chilled carcasses of small animals or quarters of large animals. These are hung from specifically designed crates (see Figure 6) which can be stacked in the same way as pallets. Internal transport must be rationally linked to that used for the reception of goods and for distribution. When the chilling and chilled storage facilities are annexed to a slaughterhouse the type of rail and the height of chambers and doors are planned accordingly. The design of the chambers must take into account the supporting rails and beams, adapting the coolers for good air circulation. The distribution of rails inside a chamber must allow for easy control of turnover with as little handling as possible. The number of rails and their location are dependent on the room's stock rotation, but keeping in mind that the length of storage for chilled meat is usually rather short. For pallets and similar stacking elements the layout of the chamber is based on the pallet module, including the size of the pallet, tolerance of air circulation and ease of manoeuvre. Different lot sizes may require different spacing of gangways. Pallets, which can be made of different materials, are becoming standardized, the most usual dimensions being 0.80×1.00×1.20 m. The shorter and longer dimensions can be increased by 5 and 15 cm respectively to set up the recommended pallet module. Stacking width is influenced by the width of the gangway and the length of the pallets. The width of the gangway depends on the forklift truck used and the depth of the pallets depends on stock rotation — the slower the rotation the deeper the pallets. Pallet stacking depth is three to four pallets for a high rotation and seven to eight pallets for a low rotation. Several layers of boxes can be used on a pallet, the number being determined mainly by the mechanical resistance of the packages and their shape for ease of piling. Five to six layers are usual and sometimes seven are possible. The number of pallets in a pile is also dependent on the mechanical resistance of the packages and on the type and reach of the forklift truck used for stacking. A stacking height of two to four pallets is the most common, but for large stores with a low rotation up to five pallets would be suitable. To avoid any problem of box resistance, fixed racks made of suitably resistant material can be installed in which pallet loads can be placed by the forklift truck (see Figure 9). The only inconvenience, besides higher installation costs, is that they occupy a fixed space. When it is necessary to save most of the space occupied by the gangways it can be worth installing movable racks, though installation is rather expensive. There is a trend toward the total automatization of stacking systems, combined with computer-controlled stock direction and checking; obviously the increased investment costs must be taken into account. Forklift trucks can be powered electrically, by LPG (liquefied petroleum gas) or petrol. Each has advantages and disadvantages. Petrol-operated trucks emit dangerous fumes so they are not recommended for meat cold stores. LPG-operated trucks produce moderate fumes and are noisy; their only advantage over electrically operated trucks is that they are faster. Electrically operated trucks need their batteries recharged every working period or alternating batteries when operated for long periods. Automatic transmission is essential so the trucks can be started and stopped accurately, and also for exact placing. Automatic transmission is incorporated in all modern machines. Special trucks are used in cold stores where space saving has resulted in movement problems. Rotating and retractable trucks (Figure 9) are an example, but their cost ranges from twice to four times that of a normal truck. Sometimes conveyors are used for internal transport, as they are less expensive than trucks. As with overhead rails, they are useful for continuous transport with no crossing traffic. The distribution of the cold store and its flow pattern are determined by their relation to the rest of the operations and the sequence they have to follow. There are some essential points to be considered. 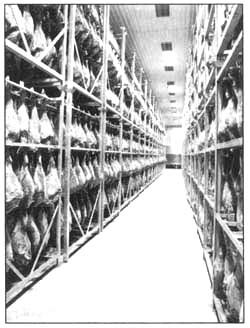 A cold store basically incorporates a reception room, where fresh meat is received and inspected at a controlled room temperature between 8° and 12°C, dispatch and holding rooms at about 2–4 °C, and one or several cold chambers for meat and offal at appropriate storage temperature. It may incorporate a cutting and deboning room at a temperature between 8° and 12°C, a packaging room and a sales room, both with a low temperature and dew point at about 5° to 7°C. For freezing and frozen storage there are freezing tunnels or rooms at temperatures ranging from -30° to -45°C, and frozen storage chambers at a temperature to suit the intended storage period. General requirements are a machine room, offices and cloakroom. The main objective in designing a cold store is to avoid unused space, so the location of labour premises, offices, etc., must be considered when filling up gaps. Cold chambers will face directly either the holding room or the cutting and packaging room. Corridors for traffic should be reduced to a minimum. The use of large anterooms kept at an intermediate temperature between ambient and storage is now obsolete, but these may be of interest in hot and humid climates to avoid condensation on the product. The location of the machinery room is of paramount importance. It should be as close to the cold rooms as possible and especially to the cooling equipment. This is one of the design difficulties to be resolved if future extension is planned. The room must be readily accessible from outside. The width of the corridors will depend on the normal traffic. If it is heavy, corridors will be designed for two-way truck movement - one-way is possible only when two trucks do not cross during transport operations. Corridor width ranges from 2.00 m for one-way to 3.60 m for two-way traffic. Width is also affected by the size of the forklift truck, i.e. the load it is able to transport, within the range of 1 to 3 tonnes. The general trend is to build traffic corridors which are wide enough for two loaded trucks to pass, even when unit loads occupy part of them while waiting for handling. In normal operation areas a width of 4–5 m is recommended. In one-way corridors any right-angle turn that might prove difficult for truck movement should have the width increased. Figure 10 gives some basic measurements that concern the manoeuvrability of the usual type of forklift truck. Door dimensions must be in relation to transport, the type and size of forklift truck and the width of the traffic corridor, if this is not wide enough for a right-angle turn the door must be sufficiently wide to allow an inclined entrance. Door width for mechanical handling ranges between 1.80 and 2.10 m. Carcasses laid on pallets need a 2.50 m door and up to 2.80 m when the corridor is not wide enough for a 90 degree turn. Door height will be determined by the height of the load: the pallet unit is usually from 2.20 to 2.80 m for normal trucks and up to 3.30 m for high stacking trucks. As height favours the entrance of warm humid air when the door is open, it should be kept to a minimum. With carcass handling door height is obviously dictated by overhead rails and the mechanism that opens and closes the doors. Door must be thermally isolated to the same extent as the walls. The insulation is placed within a rigid frame which can withstand tough handling without distortion. The doors must close tightly against the framework, exerting high pressure on a dense elastic rubber-strip filling with a very regular contact surface; the closing system must be strongenough to press the door against the strip and keep it in that position. For cold rooms at temperatures below 0°C the strip must be electrically heated to avoid ice accumulation. Although there are different ways of opening doors (rotating on hinges, sliding horizontally or vertically), the type most used in cold rooms is the one that opens horizontally. For quick opening and closing (in the range of few seconds) doors should be mechanically or pneumatically operated. The opening is activated by a photo-electric cell or more commonly by a switch pull placed close to the door which can be operated by the driver without moving from the truck. An automatic controller fixes the time necessary to pass through the door and closes it. Every time a door opens an intense exchange of inside and ambient air takes place. When openings are frequent the heat and humidity loads in the cold room may be high, considerably increasing refrigeration and frost deposit on coolers. To reduce air exchange, flexible transparent plastic doors, transparent swinging doors or air curtains are used. The first two types need constant maintenance as they often break when undergoing heavy duty; in addition they come in contact with merchandise and labourers' clothes, which is hygienically dangerous. Some precaution in design will help to reduce air exchange. The number of doors should be reduced to a minimum and they should be for one-way traffic; they should not be placed opposite each other, and should face away from prevailing winds. 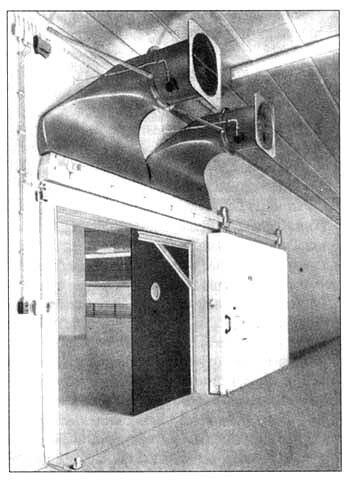 The air curtain system consists of a powerful blower, usually sited above the door, which induces a strong horizontal or vertical air draught (Figure 11). This causes dynamic pressure which balances the density effect of the inside cold air and prevents cold air leaving and warm air entering the store. The capacity of the blower depends on the door size. For instance, for a door 2 m high the air flow should be 1 500 m3/h, and for a 4m door about 3 000 m3/h. The angle of the air jet depends on the temperature difference between the cold store and the corridor. As a guide the angle will range from five to 15 degrees; the greater the temperature difference the higher the angle. The efficiency of the air curtain system is considered to be between 60 and 70 percent. Loading docks ease the handling and transfer of pallets to and from the cold stores and transport vehicles, so most stores are provided with loading/ unloading docks adapted to road or railway transport. For road transport the problem is to determine the height of the dock to correspond with average vehicle height: for trucks it will be about 1.40 m, but for distribution vans it will be as low as 60 cm. Moreover when the vehicle is loaded or unloaded its height changes, and this is particularly awkward when the forklift truck has to enter it. Levelling facilities will adjust the dock to any vehicle height; the dock and truck platform thus corresponding at any time of the loading/ unloading operation (Figure 12). Docks for railway transport can be built to a standard height. The length of a loading bank should allow the simultaneous handling of an adequate number of vehicles; it will depend on the size of the cold store and its rotation of stored produce, which also influence the depth of the bank. The minimum recommended depth is 6 m, but one of 8–10 m is considered to be more suitable. Loading docks are usually under cover, sometimes simply an extended canopy open all around and sometimes enclosed with a surrounding wall and doors. The choice of open or enclosed docks is mainly influenced by climate and the handling system employed. Enclosed docks are usually cooled and they should be used where temperature and humidity are high, and when the merchandise is handled excessively with a long exposure in conditions that are very different from those of storage. Any delay in transfer from trucks to cold store in an open dock is obviously more detrimental than in a cooled enclosed dock. Cooled loading docks must be insulated and are equipped with a refrigeration system; the floor should be heated to prevent condensation. The height of the canopy is determined by the height of the store doors plus the mechanisms above the lintels for door opening and/or air curtain. Where for economy of handling two pallets are superimposed for transfer to the cold store, this unit load height will decide the free height of the loading dock roof. 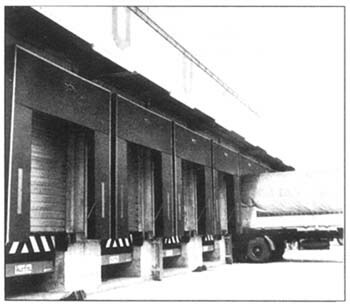 Cooled dock doors should be equipped with a perimeter cushion seal to adjust the rear of the truck to the loading door, reducing the cold air leakage. This system is usually provided with a displacement mechanism which, together with the levelling device, will ease handling and the maintenance of the loading dock temperature (see Figure 13). Part of the loading dock is sometimes utilized to house offices, cloakrooms and, particularly, a supervisor's room for the direct control of the handling operations as efficient direction in loading is essential. Battery changing facilities may also be built into the dock at a point which does not interfere with traffic; adequate ventilation should be provided to prevent gas accumulation. When the temperature of a cooled dock is very exacting warming rooms for personnel are incorporated in it. Another solution for covering the loading dock is to locate the administrative offices above it. Good insulation of the office floors is necessary when the temperature of the enclosed dock is low. The transport of meat in a chilled or frozen state must be undertaken at a controlled temperature so as not to exceed the threshold that encourages microbial development or starts thawing or recrystallization in frozen meats. Transport vehicles are classified in three categories: insulated, refrigerated and mechanically refrigerated. Insulated vehicles should be used only for short distances and for short periods of distribution when not much door opening is involved. Both types of refrigerated vehicle are employed for long hauls. Ice, solid carbon dioxide and eutectic mixtures add enormous weight to the load to be transported, reducing the space for merchandise. The same is true of the liquid nitrogen refrigeration system for long journeys as the dead weight of the cylinders containing liquid nitrogen will be too high. Only mechanically refrigerated vehicles should be considered at present for long-distance transport. Insulation should be thick enough to give low values for the overall heat transfer coefficient without reducing load space. For warm countries reinforced insulation leading to an overall heat transfer coefficient under 0.4 W/m2°C is recommended. To reduce transport time and cope more easily with vehicle movement to and from cold stores large traffic areas are recommended. The size of the forecourt of the loading docks will depend on traffic and the size of the trucks, but it should be at least 35 m wide when high traffic is expected and trucks can line up at right angles to the dock. Trucks with an overhead rail should be used for carcass transport. Rails should be standardized to ease transfer from the cold store to the truck, eliminating additional handling. Chilled carcasses must not be piled on the floor. Hygiene is vital in meat transport. Vehicles must be thoroughly cleaned and disinfected immediately after unloading or at least before loading. Floor, walls, racks and hooks must be faultlessly clean. Interior finishing should be washable and waterproof. Offal must be transported in hermetic containers made of material that is easy to clean. Poultry should be packaged individually. The slaughterhouse and cutting room, together or autonomously, are closely related to cold storage chambers so they condition the general layout of the industrial plant. When they are integrated, the design is more complicated, due to the many possibilities of flow pattern. After dressing and dousing, carcasses will generally pass quickly to chilling rooms or tunnels. As they do not enter the chilling room continuously a certain area should be provided where carcasses can be accumulated; its surface will depend on the killing rate and the chilling programme. The doors of the chilling rooms will open on to this area. There may be only one chilling room in small slaughterhouses and from two to four in others; the total capacity must suffice for peak day slaughtering. After four hours in the chilling room carcasses will move to the storage rooms. Storage capacity will be at least equal to that of the chilling room or higher if some buffer stock is expected. The number of rooms can be reduced depending on total capacity, the meat distribution programme and whether the cutting room is incorporated in the slaughterhouse. Part of the already chilled meat may be utilized for cutting and packaging, or deboning and packaging, and part for freezing. The distribution programme will indicate the average quantities for these different treatments and these will determine the capacity and size of the different sections. Meats processed in the cutting and packaging rooms may be distributed fresh or chilled, or be frozen for frozen storage or transport to other frozen storage centres. One loading dock enclosed and refrigerated to a temperature low enough to prevent surface thawing, about -10°C, can handle the shipment of all types of cuts and boxed meats. Chilled carcasses and quarters will be shifted by overhead rails and chilled package cuts and frozen meats will be handled on forklift trucks. Figure 14 is a flow sheet explaining the functioning of the meat complex and Figure 15 suggests the layout.